When SIUE first opened its doors as an established, main campus in 1965, movie tickets were only $1 and a gallon of gas cost just $0.31. While times have certainly changed over the last 50 years, the need for donor support remains. 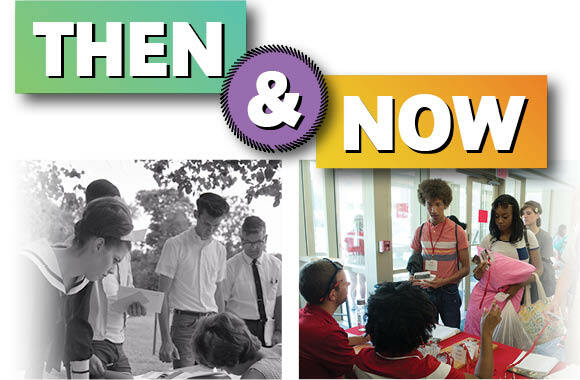 A university which began as one classroom building, a library and a few vending machines, the still-youthful SIUE now boasts eight classroom buildings, five on-campus housing facilities, two buildings of various student support services, a university center, a recreational center and Division I athletic facilities. In just half a century, SIUE has become an educational leader for the St. Louis region. Fast forward more than 50 years. SIUE broke its previous enrollment record and welcomed a student body of 14,265 in 2015. It is evident that students continue to carry the same passion for tradition and education as Ric and his friends harnessed so many years ago. These characteristics radiate from St. Louis native Michelle Krichevsky, a freshman studying pre-pharmacy. Similar to Ric, Michelle was the first student to register for classes at SIUE in 2015. “When I came to the open house at SIUE, a School of Pharmacy staff member told me, ‘If you invest in us, we will invest in you,’” she said. “I felt much more secure going to a school that genuinely cared about my education. Though a generational gap is present, Ric and Michelle share a common belief: external support is critical to student success in higher education. “I believe private donations would be able to enhance the technology and buildings, which would provide the most updated and ‘best-of-the-best’ education to students,” Michelle said. Through alumni and donor gifts, SIUE supports the University’s legacy of education and excellence by providing donor-driven student scholarships, attracting and retaining renowned faculty members, engaging students in industry-leading research opportunities, and providing global perspective through study abroad opportunities. The SIUE annual giving program is the most direct way alumni, friends and family can support every aspect of campus life, from student scholarships and classroom success to Cougar athletic victories. Gifts of all sizes truly change the lives of SIUE students, professors, and researchers. They have a direct effect on the life and people of SIUE – this week, this month, this year. Visit siue.edu/give for more information.